Ok, now that your interpreter is configured, it is time to create a project. Project name: The name of the project. Project contents: Where the project should be located in the filesystem (can be pointed to existing sources). Project type: Defines the kind of the interpreter to be used for that project. Grammar version: The grammar used for parsing the files in this project. It doesn't have to match the grammar of the actual interpreter selected. This is done so that you can use a newer interpreter while having the grammar you use compatible with an older interpreter (e.g. 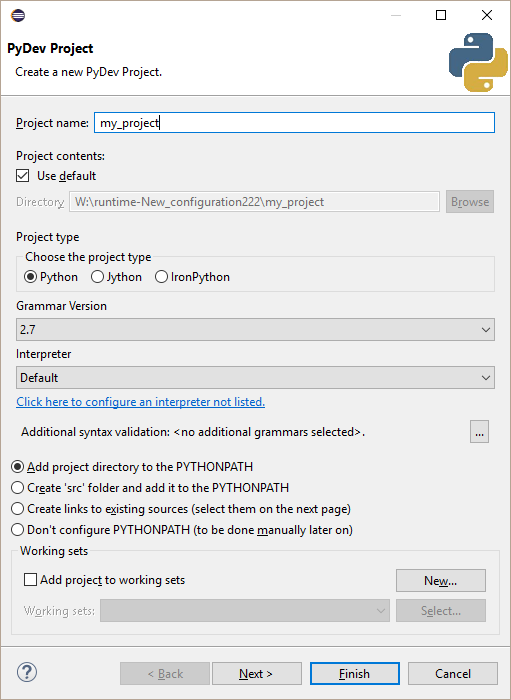 : using a Python 2.6 interpreter with a Python 2.4 grammar in the project). Interpreter: Defines which interpreter should be used for code-completion and default run configurations (note that you can still create a run configuration with a different interpreter). Additional syntax validation: Here you can add additional syntaxes to which the sources of this project should be validated (so, if a project should be Python 2 and Python 3 compatible, you could select the main grammar as Python 3 and an additional syntax validation as Python 2). PYTHONPATH configuration: It's possible to have the project directory directly be the main PYTHONPATH entry (which is the most common setup), create a src folder and have that folder added to the PYTHONPATH, create links to existing sources or don't configure any folder to be in the PYTHONPATH (in which case it should be manually configured later on). You may finish in this screen or go to the next, where you will be asked which projects are referenced from this one (or have an additional step to create links to existing sources if you chose such option in the PYTHONPATH configuration). The referenced projects are the projects whose source folders are added to the PYTHONPATH for the referrer project. If you created the project inside Eclipse, you just have to import the project again (in files > import > general > existing projects into workspace) – it'll look for the existing .project file and will configure it automatically from the existing configuration. If you have the sources from an existing project that wasn't created in Eclipse, you can either create a new project at that same location (and choose Add project directory to the PYTHONPATH) or create it in a different directory and choose create links to existing sources in the PYTHONPATH configuration in the new project wizard.